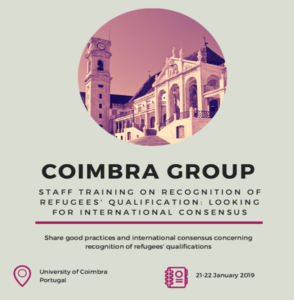 The Coimbra Group Staff Training “Recognition of Refugees’ Qualifications: Looking for International Consensus” took place on 21 and 22 January at the University of Coimbra. CG members and non-members gathered together with a number of professionals in the field of recognition and from higher education institutions implementing good practices to hear about what is currently being done in terms of recognition of qualifications in the absence of diplomas, new tools available, obstacles and possible solutions. Speakers emphasised the need to consider the human being behind the qualification and the importance of having a “can do” attitude when dealing with administrative burdens. They also provided practical examples of diplomas issues in Syria and the structure of its higher education system before and after the crisis. We would like to thank all participants and in particular our guest speakers: Marina Malgina and Ghada Aldasooqi (NOKUT – the Norwegian Agency for Quality Assurance in Education), Françoise de Viron (UCLouvain and Chairman and Director of EUCEN – European Universities Continuing Education Network), Marit Egner (University of Oslo), Marija Mitic (ACA – Academic Cooperation Association), Joana West (University of Luxembourg), Ayşegül Komsuoğlu (University of Istanbul), Helena Barroco (Global Platform for Syrian Students), Salomé Matos (CIMEA NARIC Italy). A special thanks to our hosts at the University of Coimbra for the wonderful hospitality.